Alright, so recently, I stumbled upon a neocities site named Excalipoor, and HOLY COW I adore their content. It's so good. And one of their main site sections is to review old websites that are nostalgic to them. So, you know what? That's such a good idea to me, that I'm going to do it myself and maybe get the ball rolling for more people on neocities to do the same. 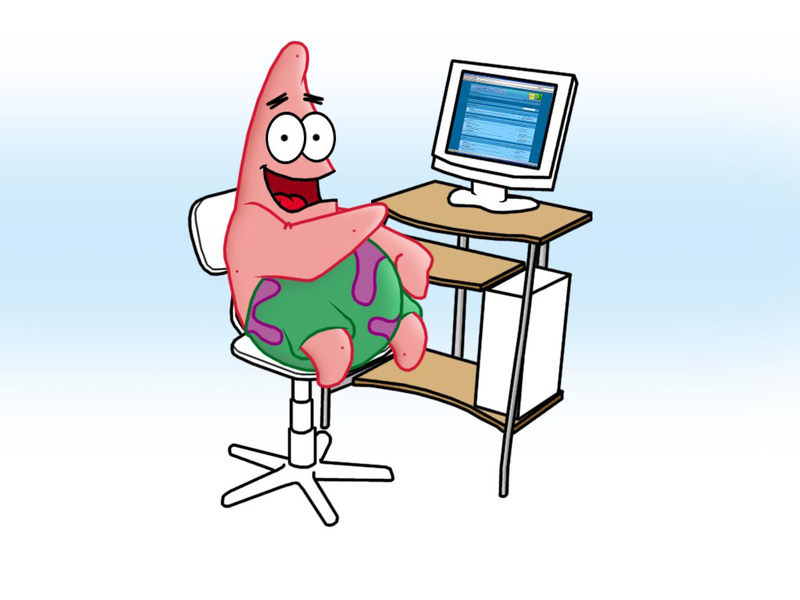 Today, for my first site review, I'm going to be doing a DUAL nostalgiasite review on two SpongeBob fansites I used to go on as a kid: United SpongeBob, and SpongeBuddy Mania. First up: United SpongeBob. For starters, this site sadly hasn't been updated since 2008... or at least the news section hasn't. Other than that, most parts of the site work completely fine (except for the photos on the Episodes section. That's completely broken.) Also, on a side note, I really like the color scheme that's going on here: a deep sea blue kind of ordeal. That scheme has always been appealing to me for reasons i can't explain. Anyways, there are several sections on the site, some of them being information about SpongeBob, the show's episodes, characters, the tie-in video games, fan video games, and other stuff. The site was created by a man who used to go by the handle "Cmonkey," and I actually did some research (and by "research" I mean just literally clicking on the creator's name on the bottom of every page) and it turns out the webmaster (named Nirav Patel) works at Oculus (yes, that Oculus) now. So, uh, he's doing pretty well for himself, it seems. United SpongeBob (or USB for short (not to be confused with Universal Serial Bus drives)) actually has a pretty good characters section, even though the blurbs might be short and the character selection might be out of date. They even include cast and crew in there, dang. The Episodes section, though…only has one season documented out of…like, what, twelve as of this posting? Though, to be fair, back when the Episodes page was made, there were only four seasons. Ah, SpongeBob back before the dark times. Good stuff. A-HEM. Anyways, every episode has a thumbnail taken from the episode and pretty good description of the plot. Pretty nice for a standard fansite. Let's move on to the Video Games section. I'm just gonna sum up this section by dividing it up into two parts: official SpongeBob video games, and fan-made ones. The official section isn't very exciting and you can probably find that stuff on a SB wiki anyhow, so let's look at the fan-made section. Oh man, here comes a local gem: SpongeBob SuperPants. It was made in Game Maker 4 (before the dirty hands of YoYoGames gunked the app into being non-free) by one person named "Bobby Fishkin." Cute. Heck, even Cmonkey made a version of the game with some bug fixes and level changes. That's pretty neat. I played the game though, and the controls... aren't good, sadly. I'd recommend passing on this fangame (or at least playing the older version where the Shift key skips through levels). Next up, we have the unfinished sequel to SuperPants: SpongeBob SuperPants 3.0. It's only a demo, and it involves good ol' SB…being transported to some underworld dimension where you have to fight demon dogs or something like that? I honestly don't remember. I will say the controls are actually a little bit better, but other than that it really isn't worth playing either. Next, we have a set of SuperPants maze spinoff games by [someone else but the site doesn't say and I'm too lazy to redownload the games to find out] and they're basically games of "HEY AVOID THESE KAJILLION ENEMIES ON SCREEN" and it's hard. And impossible. Not worth. Although, you do eventually get to shoot ammo in the third one, so that's kind of hilarious imagining SB with a gun. Heh. Finally, we have SpongeBob Volleyball, which is just a simple volleyball game with two animated SpongeBob GIFs running around on screen. Not a whole lot to talk about here. Cmonkey made that one himself, though. NEXT UP! We have the "Multimedia" section, in which there are video clips of SB episodes and various pictures, such as pictures from the show, and even AIM icons (!!) and wallpapers, too. Some of them original! I like how this was made back in the era when a lot of people still had dial-up 56.6k internet, so there are big (~360p?) and small (~240p??) versions of each video. Other than that, not much to talk about. For the "Misc." section, we have interactive house tours (which is just clicking through pictures of the houses in the show), a section showcasing letters sent from fans of the site (cute), merchandise mini-reviews, a links page (with most links broken of course), and "The Peanut Gallery," which is stuff that is too obscure to fit in anywhere else, such as a history of the site. 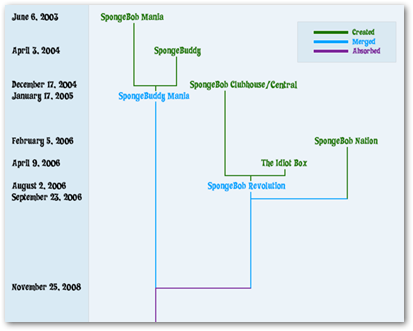 The history of the site itself is pretty interesting, in which it was actually a merger between two SpongeBob fansites, The Sponge Zone and SpongeBob Crazy. The merger happened on September 4th, 2004. I remember even going on the old Sponge Zone GeoCities site back before it was merged. Ah, good times. In fact, the history page describes what happened EVERY month until May 2005, so that's cool, I guess. I left the final two sections of the site for last: the Forums and the Chat. The Chat isn't anything special, really, just an old Java IRC applet that autoconnects to #spongebob on EFnet for you. (I think Cmonkey still idles in there, so if you've got HexChat or some other client on ya, you should really pay him a visit.) The forums, however, are a different story: if you go there now, you can see that it's a forum with REALLY old posts that sports the default Simple Machines forum theme. Now, see, when I was like 11, I think I remember the forums running on an old version of IPBoard (or phpBB2, either one), and when I came back in 2008, I saw that the forums were DOWN. I remember them being down for the longest time until when I re-visited the site in 2016 and saw that the forums were back up, but on SMB now. So, what I think happened, is that the forums were taken down due to a lack of activity (or maybe the server blowing up? Shrug), and then when Cmonkey realized he still had a copy of the forum database, he decided to put it back up but on SMB instead (for seemingly no reason). To prove it, there's a fan-made wallpaper on the site depicting Patrick using the old forums (that seems out of character, but okay), and the screenshot is really tiny, but I can tell that it most likely isn't an ancient version of SMF running those forums. That's got to be IP. ...I think. 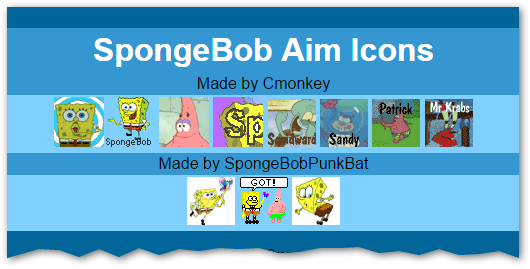 SPEAKING of SpongeBob forums, this leads me perfectly to our second site in our nostalgiasite walkthrough: SpongeBuddy Mania. Fun fact, I forgot this site even existed until recently where I watched a video on A Day With Spongebob. Interesting story, but this article isn't about that. I will say, though, this fansite has a LOT more up-to-date information about the series, such as pretty much every single character having a description and screenshots, every single episode having screenshots, every single piece of merchandise being reviewed, clips of screen bugs and interviews, etc. It's kind of amazing that this site has survived the fall of fansites that no longer get updated as the years pass. That's kind of amazing. (There's even custom wallpapers and MSN avatars on here, too.) 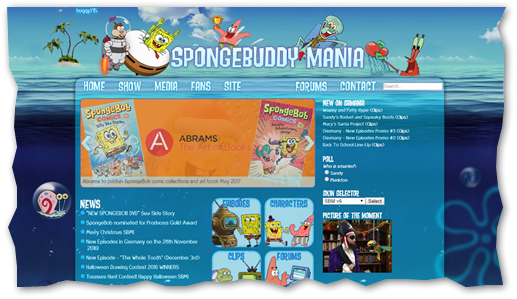 There's even an entire wiki detailing the history of the site and its moderators, and apparently SpongeBuddy Mania was a merger as well, (Man, what's up with all these SB fansites and mergers?! Jeez.) between SpongeBob Mania and SpongeBuddy, hence the name. But that's not what I'm going to talk about for this site. No, the meat and potatoes of SBM has to be its forums. What makes these forums special to me is that I signed up for them back in 2007, when I was just a young lad who really liked SB. I sadly never posted on there much (because I was a shy 12-year-old boy), but I was really surprised when I remembered that I even signed up back then. As for the forums in general, the SBM wiki says that the forums kind of had a drought between 2010-2013, but since has seen a resurgence of new users over the years. There are so many threads in this forum, from people reviewing entire /seasons/ of the show, threads of people just giving episodes number ratings, fan fiction (of COURSE), forum games, general discussion, you name it. There is even a shoutbox, a blog section, and even a social-media-esque update system on the forums. Talk about overkill. BAM. DONE. Now you have a signature that everyone else on the forum has. What, don't believe me? Check out this Imgur album I made of every one I could find (because I was too lazy to make a slideshow GIF in Photoshop). Seriously, I have never seen a case of "same signature" (as I like to call it) on a forum like this before. It's kind of weird, but also kind of amazing. And other than that, I don't really have a whole lot to say about this site other than I'm glad I found it again. I'm glad both of these fansites still exist, and I'm glad SBmania has taken off again in recent years. With the uprise of social media, forums and homepages have been pushed to the wayside. I'm glad there's still some semblance of the fandom community of the early 2000s in the form of forums and fansites like these. Thank you, SpongeBob and other cartoon fans for keeping these old treasures up. As for me, I'm going to go work on my YouTube channel.